Imagine you are looking at a pivot table like this. And you want to insert a column or row. Go ahead and try it. Here is what happens. Excel gets mad thinking you are attempting anarchy and throws a stern, but very long & confusing warning message. In fact the error message is so long, I can’t even fit it in one image on this blog. Here it goes, verbatim. Don’t bother inserting the columns in actual pivot table. Instead, follow this approach. Bonus: You can format the new worksheet cells any way you want. It just works. 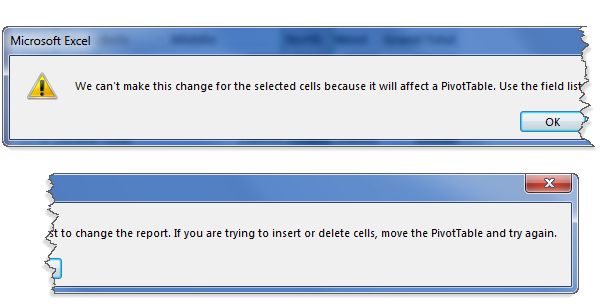 But I want to insert a column in my pivot!!! Okay, clearly you have a case of OCDIS (Obsessive Column Deletion / Insertion Syndrome). Here is one way to technically insert a column inside the pivot table. Here are few possible reasons. If your answer is 1, the above approach (copying pivot and pasting as references) gives you most control over the layout and formatting. Go for it. If your answer is 2, again above approach is still good. If your answer is 3, you can use calculated item / fields is your best option. If your answer is 3 & you are using Excel 2013 (or power pivot), you can use either Sets feature or MDX formulas to mimic blank rows. Unfortunately, I can’t explain this because squirrels know more MDX than me. Okay, so want to calculate North / West % in below pivot. 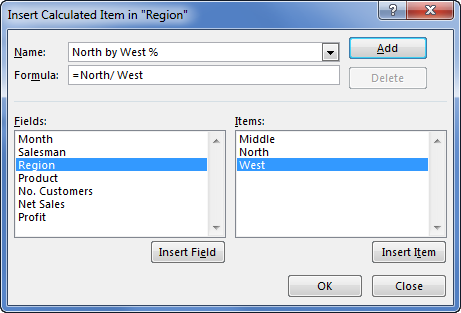 In this case, you can use calculated items feature of pivot table like this. As you can see, it works fine until we hit the grand total row. There our North / West % should be 96%. Instead it reads 386%. Clearly a number calculated by my 6 year old son. Why is the total wrong? Because, pivot table grand totals are a simple sum of all the above values. So Excel went ahead and added up the four percentages. How to fix this? One simple options is to turn off the grand totals. Note that even row level grand totals are off as the % was added to actual values. If you must see the grand totals, then your best bet is to use Power Pivot. It allows you to define formulas (using DAX) and create powerful pivot tables. So no easy way to insert columns then? It took us a few minutes to get here, but that is the answer. There is no simple work around to this problem. Instead, here is a 4 step process you should follow. Insert your favorite expletive in this sentence “______ pivot tables” and shout it. If Power Pivot cant be used, copy the pivot as references and manipulate the layout as you wish. If it is just for layout cosmetic / formatting reasons try this. Now you have your new blank column. If you add a blank row before the last record, the Pivot Table will automatically add it to the table, with a blank row and column. Where the heading might read "(blank"), you can just type a space to replace it. I frequently add "dummy" columns to my PivotTable data like this. They're always marked "X" so I know which not to use. Thanks for posting this simple solution. That is great. So simple a solution when you think about it... .. elegant. I have one problem if somebody has a solution. I have data for two months with supplier names, amount, different dates (some of data belongs to current month & some for last month. While preparing pivot, I have inserted supplier name at row label, date at column label and value at Values label and group column field by month (resulting amount coming monthwise in two columns. Now I want difference between two months. Its a cool tip and more likely in creating dashboards this event would do magic. 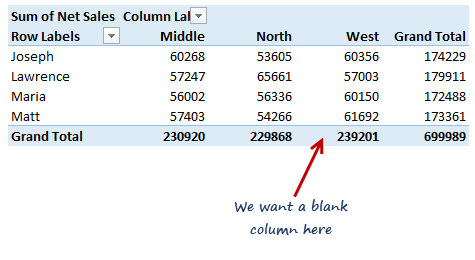 This complete guide about inserting a blank column in pivot table are quite helpful for me and saved my lots of time. I was puzzed with this problem from past few days and finally i got my answer and it worked nicely for me. Specially, the section of calculating certain percentage solved my problem. Thanks for this great help. Keep helping !! My comments doesn't stay with the row when I filter the pivot. So I assume this only works if have a set report and no requirement to filter? What is meant by "5.Paste as references – ALT+CTRL+V and L" ? The function as displayed does nothing "and L"
Hold alt, hold ctrl, press V.
Then let go of all 3 of those keys. This doesn't work. The creation of the initial reference table works, but if you add more data to the pivot table and refresh, not ALL of the data updates in the reference table. I have a pivot table with two columns 1) sum of a data column 2) count of the same data column. I'd like to add another column with % of 1)/2). Ex: 1) 17, 2) 20 so the 3rd column should be 85%.